Shell Duck Now you can own a signed limited edition print, (only 50 printed), by a successful Wildlife Artist using an original medium.At an affordable price! These signed and numbered bird pictures by Nicholas Day are printed to a very high resolution and standard, on superb quality paper with fast inks to guarantee total colour strength for at least 80 years under normal conditions. The detail illustrates the artist's unique style and medium. The pictures are set in an acid-free mount measuring 15" by 12"(38cm by 30.5cm) and is delivered wrapped in a clear jacket. 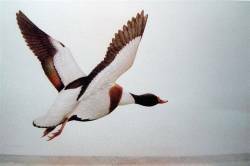 EVEN MORE BEAUTIFUL IN REAL LIFE THAN THE PHOTO SUGGESTED:GAYNOR THOMAS - U.S.A.
"Shell Duck In Flight" on an acid free mount.Size of the print is 12" by 15"(38cm by 30.5cm)This is signed and numbered limited edition of 50 only.Printed to a very high resolution and standard, on superb quality paper with fast inks to guarantee total colour strength for at least 80 years under normal conditions.You will be very impressed with the price and the quality of this mounted print. Large goose-like duck, looking strikingly black and white. Nest is a downed lined cup in burrow (disused rabbit burrow) or hollow tree 1 Brood May – June; 8-15 eggs cream Male has red knob on bill; female plain red. Shipping and handling charges through out the UK are £7.75 including insurance. INTERNATIONAL ORDERS: International Orders will have additional shipping charges billed. All charges must be paid in advance of shipment. Please note: Some quantities are limited. Orders ship quickly, if there is ever a delay, we'll let you know immediately.